The holiday tournament season, with its blizzard of upsets, created all kinds of movement in the Hockey Hub’s state Class AA rankings. Edina and Eagan are up. Benilde-St. Margaret’s and Holy Angels are down. The only constant, of course, is Minnetonka at No. 1. In Class A it would be reasonable to expect a similar amount of shuffling, given the mountain of games played statewide (more than 200) in a three-day span leading up to the new year. The top seven teams in Class A all remained locked in position, with Mahtomedi holding steady at No. 5 despite a second loss to No. 2-ranked Breck in the finals of the Schwan Cup Silver Division holiday tournament. Mahtomedi had a much better showing in Round Two, losing 4-2 after being belted 7-1 by the Mustangs in their Dec. 1 season opener. Among the biggest differences in the rematch was the presence of Ben Marshall, a whirlwind of a defenseman who showed he has more than sweet feet in the loss to the Mustangs at the Xcel Energy Center. Marshall, a junior Minnesota recruit who didn’t play in the season opener, whipped a shot from the point that clanged off the crossbar then bounced straight down into the crease. Mike Rose slammed in the loose puck to score a goal that pulled the Zephyrs to within 2-1 in the second period. 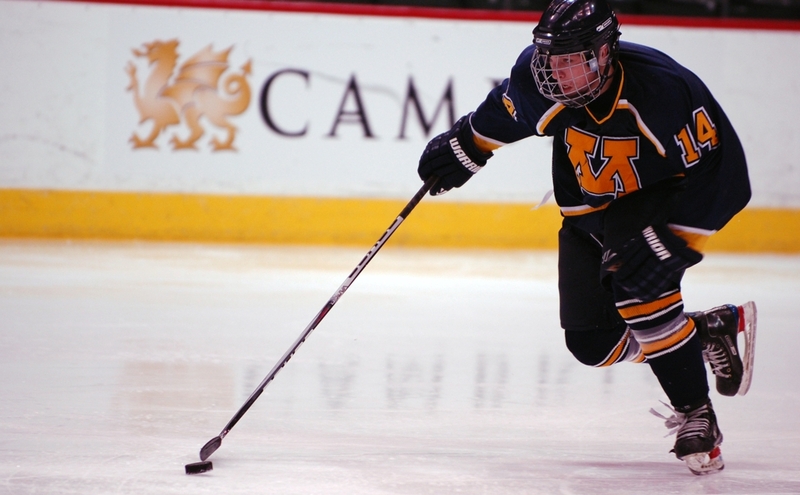 Marshall rarely left the ice against Breck. Skippers keep sailing along, beating a litany of top teams despite losing top scorer Max Gardiner to a broken wrist. Smooth-skating senior defenseman Justin Holl's emergence as a game-breaking offensive threat has come at a most opportune time. There's no "I" in Hornets. Yeah, that's a corny saying but it's oh so appropriate for an Edina team that features eight players with four or more goals and eight or more points and a deep group of seemingly interchangeable -- and nasty -- defensemen. Did we mention that goaltender Johnny Ankeny's .942 save percentage ranks third in the state? Jaguars' offense has cooled from torrid early-season pace but Jefferson still is averaging 6.5 goals per game, fourth-best in the state. Dynamic defenseman Joe Faust, a Princeton recruit, has seven goals and 21 assists and fellow defenseman Jeffrey Pauluk has an amazing 22 assists and team-best plus/minus of plus-22. Bengals have lost three of their last five and still holding steady in top 5 in the poll. That's because losses were more than respectable -- by one goal to Edina twice and by a goal to Minnetonka. The two wins in that stretch -- over Hill-Murray and St. Thomas Academy -- were high caliber. Eagles feature solid group of defenseman led by Dan Molenaar and also boast one of the state's best goaltenders in Andrew Ford. Only flaw, and it's a minor quibble, is relatively modest 3.62 goals-per-game average. Eden Prairie still getting consistent scoring from only its top line. Pioneers rebounded nicely from loss to Blaine at Schwan Cup holiday tournament by beating Duluth East and White Bear Lake to win consolation title. Tough week ahead with games against Class A powerhouse St. Thomas Academy and dangerous Tartan. Voters in the poll haven't been quite sure where to put the Trojans, but that confusion should be diminished after huge Thursday night showdown with Bloomington Jefferson. Goaltenders Alex Clayton and Andrew McIntyre have been splitting time and whoever gets the start against the high-powered Jaguars will undoubtedly have a busy night. Rams are another team that has has consistently lit up the scoreboard and opposing goaltenders. Roseau ranks eighth in the state with a 6.15 goals-per-game average. Senior forward Shane Omdahl ranks second in the state with 40 points and has not been held pointless yet this season. Wildcats make their Top 10 debut thanks to upset win over Bloomington Jefferson followed by dominating 7-1 triumph over Hopkins to win eight-team South St. Paul holiday tournament. If there's one thing you need to know about Eagan it's that junior goaltender Tommy Bodeker has allowed just 11 goals in eight starts. Red Knights stick in the Top 10 despite 7-2 holiday tournament stunner to Centennial. That surprising loss was offset somewhat by nice wins over quality Rochester Century and Wayzata teams. Intriguing North Suburban Conference matchup against undefeated Spring Lake Park set for Saturday. ALSO RECEIVING VOTES: Centennial, Elk River, Cretin-Derham Hall, Duluth East, Elk River, Osseo, Moorhead. The Cadets are, without a doubt, the best three-loss team in the state in Class A. Two of the losses have come against Minnetonka and the third against Blaine, the No. 1 and 4 ranked teams, respectively, in Class AA. Another matchup against a top Class AA team in Hill-Murray looms on Thursday. Mustangs are state's highest scoring team, averaging more than seven goals a game. Breck features two high-octane forward lines, one of which includes the underrated Chase Nystedt, the team's goal-scoring leader with 13. Nice win over Osseo, a highly regarded Class AA team, keeps the Warriors locked in the No. 3 spot. Production from dynamite senior scoring tandem of Brock Nelson and Brett Hebel has slowed in recent weeks. Hawks proved they will be team to fear come playoff time with 7-0 rout of Thief River Falls and superb goaltender Zane Gothberg. What has been only a moderately difficult schedule gets considerably tougher with road trips to hockey hotbeds International Falls and Grand Rapids. Don't be fooled by the Zephyrs' record. They play one of the toughest schedules of any Class A team in the state, and two of their losses have come to Breck. High-scoring top line of Brandon Zurn, Charlie Adams and Mike Rose is tough to shut down, and defenseman Ben Marshall, a Minnesota recruit and two-way standout, rarely leaves the ice. Blue Devils already are more than halfway through their schedule, and what a schedule it has been. Rugged mix of top Class AA and A foes has included the likes of Minnetonka, Hermantown and Mahtomedi. Junior forward Garrett Hendrickson, a St. Cloud State recruit, ranks fifth in the state with 34 points. Prowlers hadn't allowed more than two goals in a stretch of seven games before suffering 7-0 blowout loss to Hermantown. Micah Ranum and Matthew Lindquist have done the bulk of the goal scoring with 10 and nine, respectively. Game at traditional Class AA power Moorhead on Thursday will be interesting test. Cardinals' convincing win over Faribault, a team that has yo-yoed in and out of the Class A rankings most of the season, was impressive. Still looking to establish undisputed No. 1 goaltender, and sophomore Dominic Wysoski has been the latest of three netminders to take a shot at earning the starting position. Nick Maiers has posted nice numbers in goal (2.22 goals-against average, .923 save percentage) but Crusaders are averaging fewer than four goals per game. Only three Cathedral players (Jordan Palusky, T.J. Bruce and Jordan Revier) have scored five or more goals. Seven-game winning streak was snapped with 5-1 loss No. 1 St. Thomas Academy, yet another tough opponent on a schedule loaded with them. Balanced scoring has been a signature for team that has nine players in double digits in points. ALSO RECEIVING VOTES: Blake, Rogers, South St. Paul, Faribault, Spring Lake Park, Red Wing, Duluth Denfeld, International Falls.